Attention all Mel Brooks fans: Don't miss the PBS American Masters special Mel Brooks: Make a Noise, premiering nationwide at 9 pm Monday night, May 20, 2013 on PBS (check local listings). After 60 years in show business, Mel Brooks has earned more major awards than any other living entertainer; he is one of 14 EGOT (Emmy, Grammy, Oscar and Tony) winners. Yet, the comedy giant has energetically avoided a documentary profile being made, even issuing an informal gag order on his friends … until now. Brooks agreed to throw himself into a new documentary about his storied career, giving American Masters exclusive interviews and complete access to his film and photo archives. American Masters Mel Brooks: Make a Noise features new interviews with Brooks, his friends and colleagues, including Matthew Broderick, Nathan Lane, Cloris Leachman, Joan Rivers, Tracey Ullman, and his close friend, with whom he created The 2000 Year Old Man more than 50 years ago, Carl Reiner. A DVD with bonus material will be available Tuesday, May 21 from Shout Factory. 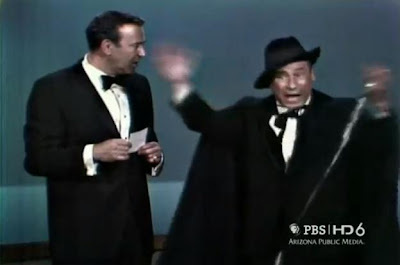 And here's a short clip from the American Masters tribute: Rob Reiner tells about the time that his father, Carl Reiner, and Mel Brooks were writing a six minute segment with the 2000 Year Old Man for the Ed Sullivan Show. Rob suggested a joke to his father about how applause was invented (by Sol), and he was thrilled when Carl and Mel actually used it in the show. Can't wait to watch it! !